We love designing all sorts of cake toppers for all sorts of events and occasions. Recently we’ve had heaps of fun using different materials with a combination of cutting and engraving! To celebrate our new design possibilities, we decided on a competition just in time for Valentine’s Day. Imagine your romantic rendezvous, complete with a deliciously seductive cake, topped with your favourite expression of love, beautifully engraved to capture the moment forever…. well, perhaps not quite like that but you get the idea. You don’t have long to enter on Facebook, so put your thinking cap on and get social with us. You can enter as many expressions as you like and don’t worry if others have the same saying, your entry will still count. Tip: Great literary works, classic films and Pinterest are a great source of inspiration. Thanks for entering… we love knowing what you love! Type in your favourite “expression of love” in the comments section under the competition post. “Like” our post and page to spread the love. Enter again with another expression or saying you’d fancy for any event to celebrate love. Check our Facebook page after noon AWST Tuesday January 24, 2017 to see if you won. The winner will need to message us on Facebook so we can organise where to send your topper. One “expression of love” entry will be randomly selected from all comments listed on Facebook. Sandra Dillon Design reserves the right to exclude any entry deemed inappropriate. If more than one entrant has submitted the winning “expression” then one entrant from that “expression” group will be randomly selected. The first and only prize will consist of a cake topper that uses the winning “expression” in a design by Sandra Dillon Design. The total value of the prize is not to exceed A$85 which includes design, artwork, laser cutting, engraving, materials and standard postage to one address. Sandra Dillon Design reserves the right to select appropriate materials and specifications to suit their design interpretation of the winning “expression”. Design copyright of the topper remains with Sandra Dillon. 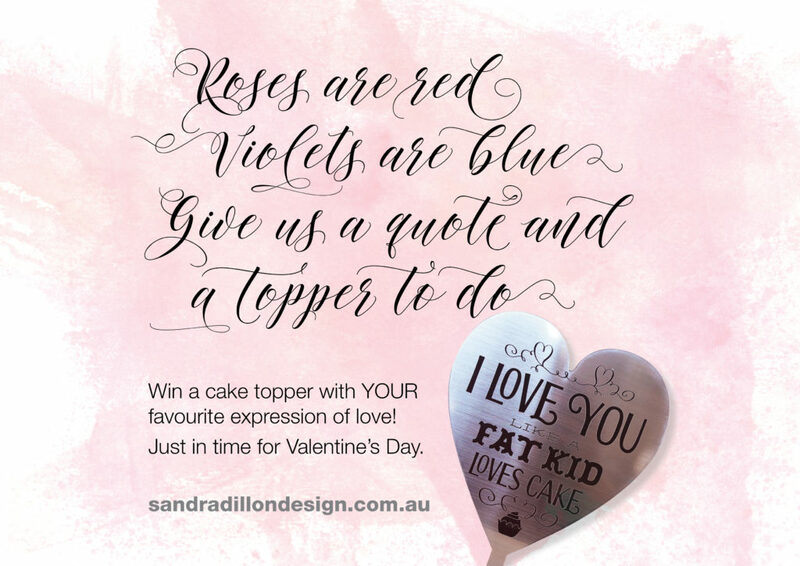 The final topper design may be used as part of the Sandra Dillon Design range and sold accordingly. By entering this competition, entrants give Sandra Dillon Design all rights to use their entry as Sandra Dillon Design sees fit without remuneration or acknowledgment. The topper prize will be shipped from our studio using Australia Post. Sandra Dillon Design will not be held liable in any way for delivery/condition of parcel. Sandra Dillon Design reserves to cancel this competition due unforeseen circumstances. To enter this competition means a complete release of Facebook has been granted. Winner will be drawn Tuesday, January 24 2017 prior to Facebook announcement. This entry was posted in Valentine's Day and tagged Valentine's Day.